The new Google Pixel 3 XL was made official last week, the handset is Google’s latest flagship Android smartphone and now we get to see how the handset compares next to Samsung’s flagship smartphone. 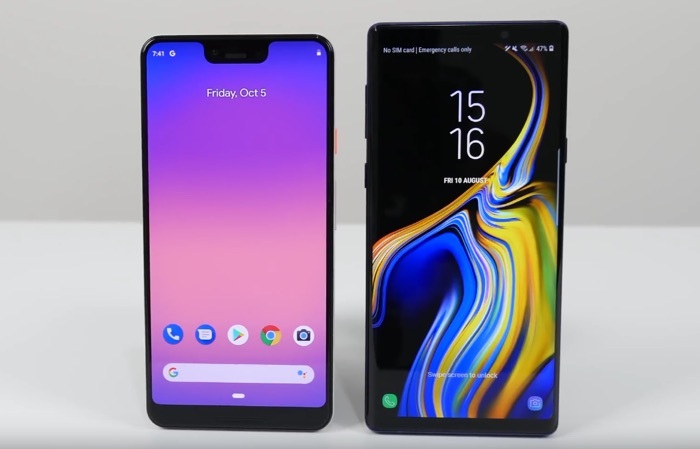 In the video below from SuperSaf TV we get to have a look at the Pixel 3 XL side by side with the Samsung Galaxy Note 9. The Pixel 3 XL comes with the latest version of Google’s Android OS, Android 9.0 Pie and the Note 9 has Android 8.1 Oreo, it will be getting the Pie update some time soon. The two devices have similar specifications. The Pixel 3 XL has a 6.3 inch OLED display and the Note 9 a 6.4 inch OLED display, both handsets are powered with the Qualcomm Snapdragon 845, although the Samsung device does have an Exynos processor in some countries. The Note 9 has 8GB of RAM and dual cameras and the Pixel 3 XL 4GB of RAM and a single lens rear camera.